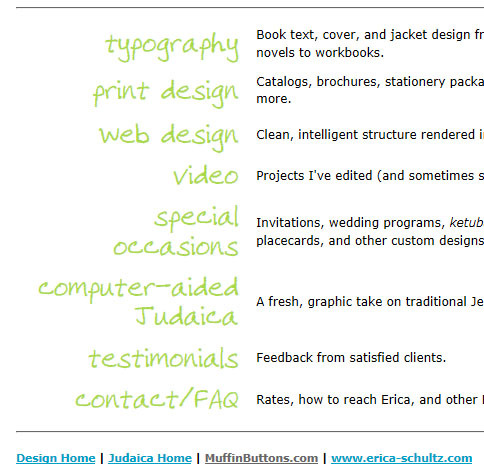 When I last rebuilt erica-schultz.com back in 2012, I decided to incorporate a custom webfont in my Design and Judaica sections. In the interest of cross-browser compatibility, I used FontSquirrel’s free Webfont Generator to export EOT, SVG, and WOFF files, which I then called in my CSS @font-face declaration. Fast forward to late 2016: I discovered that while my font still looked nice in Safari, it had stopped working in Chrome and Firefox. They had apparently gone and changed their font rendering in a way that broke my site. THANKS DUDES. This week, I finally did a little research into the issue. First I checked to see if there were any new formats I needed to know. Indeed, it turns out there’s a new version of WOFF called WOFF2, designed for better compression results. So OK, I went back to FontSquirrel, re-exported my webfont package, and added the WOFF2 to my site assets and CSS. Now my font files were, in fact, hosted locally, but in my CSS file I had specified the locations as complete URLs. I changed them to relative URLs, reloaded, and voilà! Firefox had my font back! Chrome still showed the broken font, though. Why? Well, of course, it was a caching issue. When I opened it in an incognito window, it finally came up correctly. Pro tip: Always do a hard refresh when reloading isn’t enough. So now that it’s back: what’s the custom font? Back in 2007, I paid Fontifier $9 to make a webfont out of my own handwriting. (The price has apparently not gone up in 10 years, so it’s still a bargain.) You fill out their template, scan and upload it, and it digitizes the characters and returns a TrueType font. To improve the final product, I invested some time in a few extra rounds of revision: previewing my results and adjusting my scan in Photoshop to get the heights and baselines as consistent as possible. It’s still not perfect — individual letters written in isolation will almost always come out looking different from the letters you write together in a flow — but it’s pretty good. If you like it too, you can grab the .TTF that I’ve made available as a free download from my website: EricasHandwriting.ttf.